First ATMs performed tasks like a cash dispenser, they were offline machines which worked with punch cards impregnated with Carbon and a 6-digit PIN code. Maximum withdrawal with a card was 10 pounds and each one was a one-time use card - ATM swallowed cards! 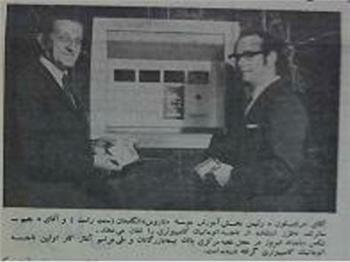 I found this picture, which is taken from a newspaper back to the year 1972 in Iran. Shows Mr. Rad-lon (if spelled correctly), The manager of Barros (if spelled correctly) International Educational Institute in United Kingdom at the right, and Mr. Jim Sutherland - Expert of Computer Kiosks. Mr. Rad-lon (if spelled correctly) puts his card to one specific location of Automated Computer Kiosk and after 10 seconds he withdraws his cash. 2- I didn't find any text on Internet which state about "Automated Computer Kiosk", Is it valid or were they been called Computer in that time? Answers, as I remember them. They were fast because they were connected to leased lines and a dedicated server at the bank. Bank software was written in medium and low level compiled languages (Cobol, PL/I, Assembler) with non-relational databases (IMS, IDMS, etc). Response times of 1-2 sec were routinely achieved. ATM is relatively new. The first modern ATM was an IBM 2984 and came into use at Lloyd Bank, Brentwood High Street, Essex, England in December 1972. I used these machines in London in 1973, and they were called Cashpoint or 'hole in the wall'. The electronics in these machines was custom built, based on a VDU display terminal and a customer multi-chip processor. Microprocessors were not available until somewhat later. No, they did not use punched cards or relays. A little perspective, please! Most computing devices of that era were purpose-built - case, display, circuitry, operating system, backend process (if any): the whole works. This was both to get decent performance out of the beast and because there were no reasonable alternatives, general purpose CPUs were not available until the early 1970s. This doesn't mean they could only perform basic functions: the Apollo Navigation Computer was hand-wired and went to the moon and back. But it won't do anything else. ATMs in 1967 didn't need to be complex. There was no international banking network, no multiple card types to handle (just that one bank's), no encryption to deal with. Just read the stripe, send the card number and PIN to the backend mainframe, and discharge a pre-selected amount of money. Not the answer you're looking for? Browse other questions tagged programming-languages history or ask your own question.